On October 1st, 2017, Austria’s controversial new bill called the “Prohibition for the Covering of the Face” went into force. The law, coined the “Burqa Ban,” forbids any kind of full face covering, including Islamic veils such as the niqab or burqa. Under this law, devout Muslim women wearing the full-face and body veil in public will be fined €150 and police may use force if a person resists showing their face. This law is likely to affect 150 women – or 0.03% – of the Austrian Muslim population and 0.002% of the entire population. In an attempt to avoid accusations of religious intolerance and racism, the law bans any kind of full-face covering. This includes in certain circumstances wearing ski masks, surgical masks, party masks, and clown makeup. As seen in the image above, the top row is allowed; the second row is forbidden under certain circumstances; and the third row is banned. Since the law is so broad and went into effect in October, many Austrians were worried about wearing masks on Halloween. However, the interior ministry reassured Austrians that the fine would not be imposed on Halloween costumes since the occasion of Halloween falls within the exceptions of permitted circumstances. Similarly, this law does not apply to professionals who must cover their face while performing their job. There have been reported situations where police have stopped people wearing scarves while biking. The most news-worthy story occurred when an Austrian police officer fined a man for wearing a shark costume for promotional purposes, despite the fact he was wearing it as part of his job. The bounds of this law are grey and foggy and have sparked much criticism and the subjectivity of police enforcement is being called into question. The decision to ban the burqa in Austria is a part of a plan to “integrate migrants.” Austria’s parliament has also banned foreign sources of financing and is requiring imams to be able to speak German. The aim has been to promote what is being called “Islam of European Character” by softening foreign Muslim influence and giving Austrian Muslims both increased rights and obligations to practice their faith. However, the laws have been criticized as discriminating by imposing restrictions on Islam that other religions do not have to deal with. The law was passed during a time of when an estimated 200 people from Austria have gone to Syria and Iraq to join the Islamic State of Iraq. There are about half a million Muslims in Austria’s total population of 8.5 million. A poll published by the OGM institute found 58 percent of Austrians feel "radicalisation" of the nation's Muslims is underway. Austria is not the first country to ban burqa’s. Weeks before Austria, Germany’s parliament approved a similar law. 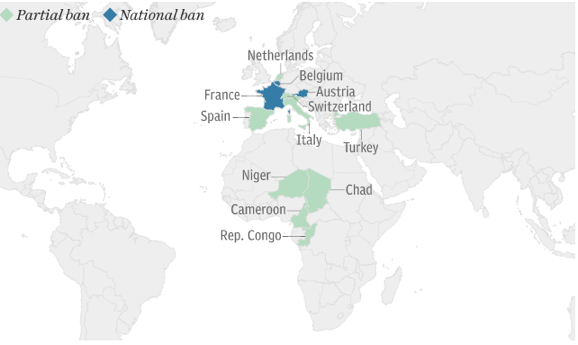 There are twelve other countries have put some kind of ban on the burqa. France was the first European country to ban the burqa beginning in 2004 with an effort to curb the display of any form of religious symbols in state-run schools. By 2011, the government of France put a total public ban on the full-face veil. In Chad in 2015 there were two suicide bombs. In a reaction to this, the Chad government banned full-face veils. Similar to Chad, Cameroon banned burqa after suicide bombings by people in veils. Niger and Congo-Bazzaville have banned the veil in certain regions as well for due to similar reasons. A predominantly Muslim population, Turkey banned headscarves in state institutions, however, today people can now wear the veil everywhere except in the courts, military, and police. Most recently, Switzerland passed a full-face veil ban in a specific region in July of 2016 with a fine for of €9200 for noncompliance. Overall, there is a trend of banning full-face coverings due to a fear of terrorism. Whether the ban occurs after a terrorist attack committed by a person wearing a full-face veil, or by those in fear of the many reported attacks like this, it seems to be the reason underlying the burqa ban trend. Support for the law is strong nonetheless. Austrians say that “it’s not right that [people who live in Austria] don’t show their faces.” Five in seven members of who backed the law also said they will vote for the parties that critics link to anti-Muslim sentiment — the Freedom Party and the People’s Party. The People’s Party was previously a part of a coalition that allowed more than 100,000 migrants in 2015, however, the party now says that “the political establishment failed in dealing with the refugee crisis.” Before the legislation was approved, President Alexander Van der Bellen claimed that he supported a woman's right to wear an Islamic headscarf — and even appeared to suggest that all women should wear a headscarf in solidarity to battle prejudice against Muslims. In the end, he still signed the ban on facial coverings, saying that he did not welcome it but that it also was not in conflict with the constitution. In application, the ban has been enforced stringently. Police have been reported stopping bikers with scarves and people in costumes for promotional work in accordance with this new law. Some say the police are enforcing the law too stringently, “interpreting the statute in somewhat extreme fashion.” It will be interesting to see if any changes occur in light of the public uproar towards the application of the new ban, however, it seems as though the law overall is supported in Austria despite the application. Federal Act on the Prohibition of Face Covering in Public (Oct. 1, 2017), https://www.ris.bka.gv.at/Dokumente/Erv/ERV_2017_1_68/ERV_2017_1_68.html. George Jahn, ‘Burqa ban’ Law Signals Rightward Political Turn in Austria, PBS News Hour (Sept. 30, 2017), https://www.pbs.org/newshour/world/burqa-ban-law-signals-rightward-political-turn-austria. Aamna Mohdin, Austria Just Slapped a Burqa Ban on the 150 Women Who Dare to Wear One, Quartz (Oct. 1, 2017), https://qz.com/1090885/austria-just-slapped-a-burqa-ban-on-the-150-women-who-dare-to-wear-one/. 'Burqa Ban' Law Comes Into Force in Austria, Prohibits Any Kind of Full-face Covering, News Nation Bureau (Oct. 2, 2017), http://www.newsnation.in/world-news/burqa-ban-law-comes-into-force-in-austria-prohibits-any-kind-of-full-face-covering-article-183362.html. Josephine Huetlin, In Austria, It’s the Burqa Ban vs. Halloween, Daily Beast (Oct. 14, 2017), https://www.thedailybeast.com/in-austria-its-the-burqa-ban-vs-halloween-on-election-eve. 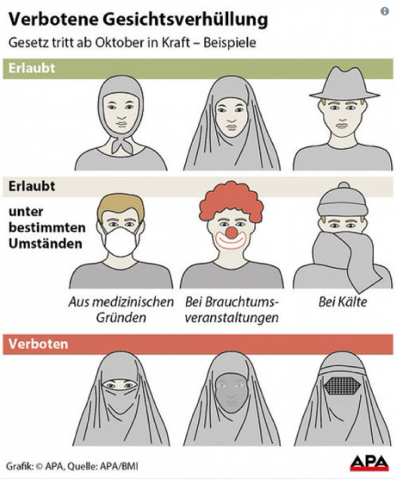 Rick Noack, Austria’s New Anti-Burqa Law Isn’t Quite Working as Intended, WorldViews (Oct. 9, 2017), https://www.washingtonpost.com/news/worldviews/wp/2017/10/09/austria-wanted-to-ban-burqas-now-it-also-fines-mascots-and-stops-cyclists-who-wear-scarves/?utm_term=.90874b5d6349. Austrian Law Rules Imams Must Be Able to Speak German, AFP (Feb. 25, 2015), http://www.aljazeera.com/news/europe/2015/02/austrian-law-rules-imams-speak-german-150225174349959.html. Neal Baker, Burka Ban Why Has Austria implemented a Burka Ban and Which Other Countries Want to Stop Women Wearing the Full-Face Veil?, The Sun (Aug. 2, 2017), https://www.thesun.co.uk/news/2341530/burka-ban-austria-germany-burkini-algarve-women-full-face-veil/. Radhika Sanghani, Burka Bans: The Countries Where Muslim Women Can’t Wear Veils, The Telegraph (Aug. 17, 2017), http://www.telegraph.co.uk/women/life/burka-bans-the-countries-where-muslim-women-cant-wear-veils/. Mike Wright & Associated Press, Austria’s ‘Burka Ban’ Comes Into Force, Prohibiting Face Veils in Public Places, The Telegraph (Oct. 1, 2017), http://www.telegraph.co.uk/news/2017/10/01/austrias-burka-ban-comes-force-prohibiting-face-veils-public/. Austrian Law Rules Imams Must Be Able to Speak German, supra note 12.